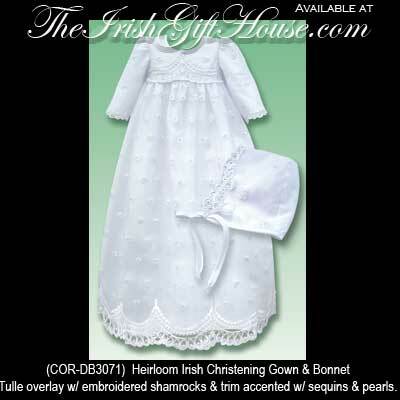 This Irish Christening gown is enhanced with shamrocks and faux pearls. Sorry this Irish baptismal gown is now sold out. This shamrock Christening gown is destined to become a family heirloom for baby baptisms in the future. The Irish Christening gown features tulle overlay with embroidered shamrocks along with trim that is accented with sequins and faux pearls; a bonnet is included. The Christening dress is 100% polyester and is received in a keepsake bag along with a shamrock history card, complements of The Irish Gift House. Irish baby bonnet with shamrock lace is known as the magic baby bonnet and it is ideal for baptism and latter baby's wedding.